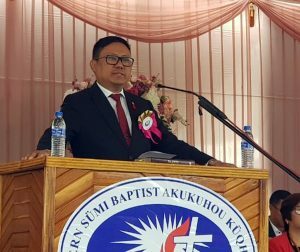 Commissioner and secretary, Y Kikheto Sema, speaking at the revival hour of the Sumi Baptist Akukuhou Kuqhakulu (WSBAK) in Kiyezu ‘B’ village, Dimapur, on February 10. Dimapur, Feb. 10 (EMN): Expressing concern over complacent attitude of the present Naga youth and its subsequent impending economic implications, commissioner and secretary of finance and land resources, Y Kikheto Sema, urged upon the youngsters to work and eat rather than remaining idle and becoming a liability to the society. Exhorting a mammoth gathering at the Sunday morning service of Western Sumi Baptist Akukuhou Kuqhakulu (WSBAK) revival hour in Kiyezu ‘B’ village, Dimapur, on February 10, Kikheto Sema spoke about the impending danger of the Naga people becoming servants in their own land if they continued with the trend of allowing immigrants to take care of their fields, properties and all other works which the Naga themselves could do those works. “Revival hours and crusades should not only be seasonal since the positive effects fade away immediately but should have a long term effect,” said Y Kikheto Sema. Kikheto also wondered as to how many of the people gathered would still continue to carry on the current revivalism till the next since many revivalists do not fulfil the commitment they make. He called upon the congregation to make peace with neighbours and the people at large irrespective of the communities and borders so as to fulfil God’s will to love their neighbours. 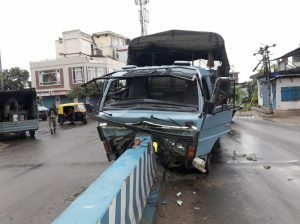 Kikheto was of the view that Nagaland needed revival even during elections as it was during such time that Christian principles were placed at the back burner. He indicated that Christian leaders should find time to organise similar revival hours even during electioneering times given the fact that violence and hatred erupt regularly during such times. Kikheto further urged upon the youngsters to work and eat rather than remaining idle and becoming a liability to the society. He also talked about the impending danger of the Naga people becoming servants in their own land if they continued with the trend of allowing immigrants take care of their fields, properties and all other works in the guise of an employee while the Naga themselves could as well do those works. The revival hour was held from February 8-10 and attended by 160 churches with an approximate 7000 people.